ok, this is a super techie post. one that probably only a very specific handful of people may glance at and a even smaller amount will actually read. but, it has taken me a long time to work this out and i figure there has to be at least one other person out there banging their head against the wall trying to figure this out. so if you don’t shoot film or don’t scan your own negatives or don’t use Vuescan, now is a pretty good time to stop reading before i bore you. when i started my Love Your Face project i deliberately wanted to shoot it on film. the depth-of-field control on medium format is much greater than on 35mm. plus the i love the images coming off of my Mamiya RZ67. over the last 6 months i’ve scanned hundreds of frames on a Nikon LS-8000 scanner. though because Nikon’s scanning software is outdated (and not very good to begin with), i use a program called Vuescan. Vuescan has become one of two very popular third-party programs amongst photographers still shooting film, the other being Silver Fast. i’ve used Vuescan for years but only ever for small things or travel pictures. i learnt very quickly that the color of my scans were very inconsistent, and my search to find a way to profile my scanner began. Vuescan’s user guide isn’t the best, more of a walk through the program than how to actually use the program. the first thing i want to clarify is the difference between Scanner Profile and Film Profile in Vuescan. this confused me for the longest time. 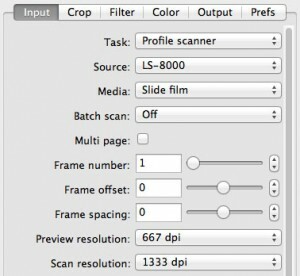 Scanner Profile is the calibration of color specific to a film or film type that is being scanned. Film Profile is the calibration of color specific to a frame on roll a of film that was photographed with a film target used to reference the color in a specific shoot or location or lighting situation. to profile your scanner for a specific type of film you will only need to worry about Scanner Profile. if you’ve gone the extra distance and shot a film target reference board during your shoot to gain a precise color reference then you’d also use Film Profile. before you can start profiling your scanner you’ll need IT8 film targets. i bought mine from Wolf Faust at coloraid.de. you can buy specific film targets or a bundle that provides you with basically everything you’ll need. i bought the bundle. Wolf packages everything quite nicely, even providing a humidity indicator to make sure the film targets stay dry and accurate. shipping to Canada took about 2 weeks, if you’re in Europe it’ll be much faster as he’s based in Germany. profiling your scanner with a film target is pretty basic in Vuescan. – under the Input tab change the Task to Profile Scanner. – under the Input tab change the Media to Slide Film. – [updated step] under the Color tab change Scanner IT8 data to reference the IT8 file that came with your film target. this will tell Vuescan how to read each color in the target. – make sure that you’re film target is straight and press Preview. – your selection box will look like an IT8 film target, match your selection box as close as you can to the film target. – under the Profile menu select Profile Scanner. Vuescan needs to know what colors to reference and how to reference them while scanning. this is accomplished by pointing Vuescan at the ICC profile you created and the IT8 reference file that accompanied the film targets. make sure to save the matching IT8 reference file to a folder you remember, preferably in the same folder as your ICC profile. 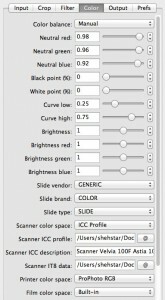 – under the Color tab change the Scanner Color Space to ICC Profile. – for Scanner ICC profile, browse and select the scanner ICC profile you created. – for Scanner IT8 data, browse and select the IT8 reference file that you saved. this was the step that took the longest to discover, and probably the most crucial. once you’ve profiled your scanner and referenced the files, you’ll still need to manually white balance your IT8 film target. – make a selection within the grey of the film target. 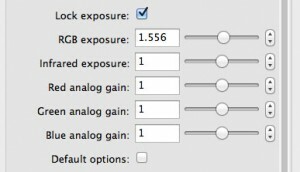 – under the Input tab select Lock Exposure. – under the Color tab changed Color Balance to Manual. – take note of the Neutral Red, Green and Blue. – open the scanned file in Photoshop and hover over Grey Scale box 0 and Grey Scale box 12, take note of their RGB values. all of the values should be within a few points of each other. one thing to make sure is that box 0 doesn’t peak, 255/255/255. if so, bring down the RGB Exposure under the Input tab. – if the values of the Grey Scale boxes are off, go back into Vuescan and adjust Neutral Red, Green and Blue accordingly. it’s really a guessing game on how much to adjust. the last step is to save all of these adjustments so that you don’t have to do it again. – under the File menu select Save Options. – title your preference something descriptive and press save. the default location of the preference file is in Vuescan’s preference folder (as stated above). DONE! you’ve now successfully profiled your scanner for a specific film type. – i’ve read that Vuescan’s ICC profile creation isn’t the most sophisticated and using several open-source code programs do a better job. while creating a more precise ICC profile is appealing, compiling open-source code and creating a software shell to house it in is definitely not appealing. maybe when i find some free time that i’m not doing many other things i enjoy i’ll tackle that. – i set my Black Point and White Point to 0 (under the Color tab). this makes for a very neutral scan. all of my initial files, film or digital, are purposely kept neutral to give me the most amount of room to process. this will affect your white balance a little bit. getting a properly profiled base scan is very important, so i hope this helped a few people. good luck! This process has taken me surely at least the same time it did take you. Interestingly, I came to the same results. White balance is enormously important, otherwise you often get either a green cast or a magenta cast. I am still a bit curious whether WB has an influence on the profiling process itself. One thing I noticed it that you advised to profile the IT8 target BEFORE choosing the IT8 data file. From what I remember, the data file is necessary to generate the ICC profile. But I will try it your way when I am back at my scanning workstation. Thanks a lot for investigating Vuescan and IT8 calibration, it is very difficult to find information and reports from others about it. You bring up a good point about creating profiles with the data file. I’ll have to do some tests to see how that works. I don’t remember a place to input the data file prior to creating a profile in Vuescan. Going to have to take a look. Christian, you are right about the IT8 data file. It seems like I missed that step in the profiling process, it does help with color. Thanks! BTW, I am about to give your idea a try to adjust whitebalance to the IT8 target. So far, my understanding was, that whitebalance deviantions should be cared for by the IT8 profiling process itself. But I always ended up to get a constant whitebalance offset towards magenta or green. That offset was fixed effectively by lightrooms auto-wb function, in essence applying -25 color cast to all files. But it would be nice to get rid of the color cast in vuescan already. Some additional information I gathered while reading into IT8 profiling with Vuescan. I makes sense to set white and black points to zero. This is the only way to adjust to the effective dynamic range of each type of film by setting them in Lightroom, Photoshop or similar tools afterwards. Vuescan’s profiling does only correct for color deviances. It does not adjust for dynamic range. I tried external tools for creating a ICC profile for use in vuescan. These larger profiles also contained the right allocation of black and white values. But I always ended up with a larger color cast towards green or magenta than using Vuescans own calibration function. Plus, applying the profile was only possible via Photoshop was vuescan can only work with its own profiles. This was additional workload and after accidentally applying the ICC profile twice to a batch of hi-res scans, effectively ruining two hours of scanning work, I am using Vuescans profiling since then. I initially assumed that the IT8 profile would correct for whitebalance. My scans still had an odd magenta or green cast, magenta or green. After I whitebalanced the IT8 profile I found that my scans were more accurate. I still feel that the images are still slightly green for my liking, but that could do with Fuji have a blue/green cast in their films. It doesn’t help that Vuescan’s previews are not 100% colour accurate. It’s great to have someone to discuss scanner profiles with. There aren’t many of us around anymore, lol! Indeed, discussions like this are getting quite rare! And there is so much to discuss as there are so many variables to play with that have influence on the final result that the possibilities of making one or multiple mistakes are endless. For instance, the orientation of a slide in the scanner does not only have influence on the sharpness but introduces a color cast as well. Then, there is the influence of the developing lab. If something gets wrong (some suggest it has to do with freshness of the developing chemicals as well as its pH value), you get a green cast in the slides. I had it when using a cheap lab for 35mm developments, and it was gone after changing the lab (using original Fuji lab today). I only noticed it because for my very first slide, I used a premium lab and these slides came back normal. I was very frustrated first when I couldn’t make the cheap developed slides match to the IT8 targets. Because it was a different film (Kodak), I thought there was something wrong with that target. But when a Velvia came back with a green tint and my first Velvia from the premium lab still matched the same IT8 target, I knew there was something wrong outside my digitalizing process. Sadly, I now got back a Velvia 100 with green tint from that Fuji lab. An Velvia 100 rollfilm sent in the same day came back two days earlier (the 35mm version had to be framed, takes additional days) and is OK.
I’m not sure how old this discussion is. The website says the comments were all added in the last 24 hours, but the blog is over a year old, so I suspect the comments are that old too! Anyway I’m just going through the process of profiling my scanner for use with VueScan. It is extremely frustrating! My experience is that VueScan does an extremely poor job of profiling, which is why you are both ending up with strong colour casts requiring the additional white balance correction. VueScan is very fickle with the alignment of the crop frame, which leads me to believe it is not applying any “safe” buffer when sampling the squares, which might be what is causing the bad profiles. You can tell there is something very wrong with it because generating several profiles after doing fresh preview scans results in significantly different profiles every time, even without touching the crop box! There are also other bugs in the VueScan profiling system which I won’t list here. I use LProf (http://lprof.sourceforge.net/) to generate the profile instead. It is open source, runs out of the box, and provides a fantastic profile checker that shows the deviation in colour of each sample square from the values supplied with the IT8 target. The application hasn’t been updated since 2006 but works fine. To use LProf, you need to scan the IT8 target in VueScan and generate a raw file in TIFF format (NOT a TIFF file in .dng format!). You load this raw TIFF into LProf together with the IT8 data file to generate the profile. When you open the raw file in photoshop and apply the generated profile to it, you should have a very good representation of the true colours of the IT8 slide, including white balance, as it should be. If instead you apply the profile generated by VueScan you will find that the white balance is completely wrong. Scanner profiling should inherently fix white balance, so I’m afraid to say the profiles you generated using VueScan are probably junk. This leads to the issue that Christian raised, that VueScan only works with its own profiles. This is a bug that Ed (the author of VueScan) confirmed to me today (31/1/2013), as he said it should work with any profile. My experience is that it just silently ignores any foreign scanner profile and uses the built-in profile instead. Christian, can you confirm when you wrote your comment? If it was last year it would indicate the bug has been around for a long time but never reported. The same bug applies to film profiles, but interestingly if you specify the profile as the monitor profile VueScan reads and uses it, although that is no help to anyone! Unless this bug is fixed the only workaround is to scan using VueScan’s built-in profile with color balance set to “none”, then in photoshop apply a profile that was generated in LProf from a processed TIFF instead of raw TIFF, and finally do all image specific white balance and levels in photoshop. Thanks for commenting! I really like the discussion that has come out of this post. It’s helped me a lot in profiling in VueScan. Christian and I were going back and forth this past summer. After a WordPress update my comments got messed up, and I hadn’t taken the time to figure it out. It’s back to normal now. I’ve heard a lot about how VueScan’s profiling isn’t very good, at the time I was shooting an ongoing film project and needed something that was better than no-profiling (not that it was much better). There is so little good information about profiling VueScan that I ran with what I had. I would love to be able to properly profile my film, especially now that I have the time to do it. Do you know of anything similar to LProf that works with the current Mac OS? I’ve tried to work with a few open source profiling apps but with no luck. OK it turns out that VueScan can only use simple matrix profiles, not the more accurate LUT (lookup table) profiles. LProf and most other profile generation applications do not provide the option of generating matrix profiles. Apparently you can create them using Argyll CMS but that is a command line tool. If anyone finds a user-friendly GUI tool please let me know! 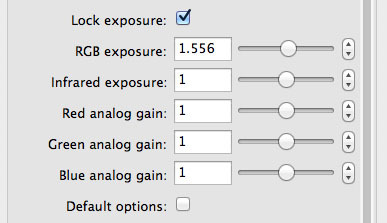 Or even a tool to convert a LUT profile to an approximate matrix profile. 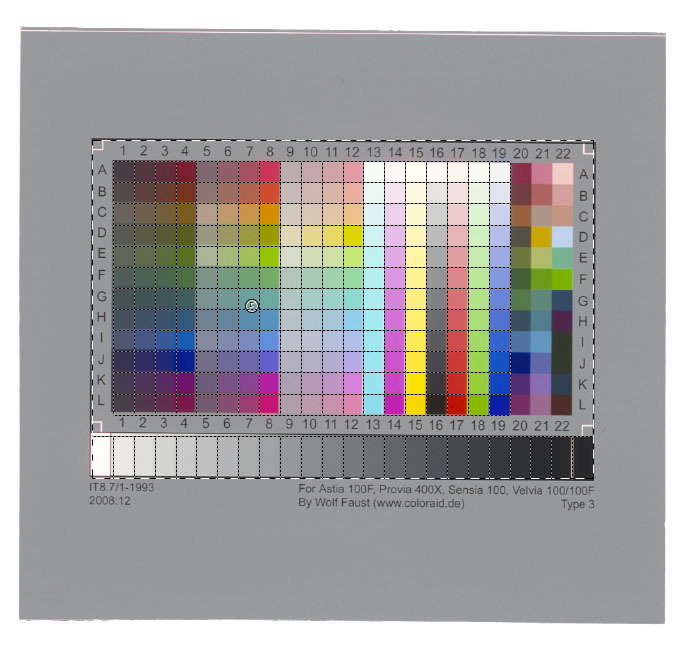 Apparently color profiles of scanners can be represented reasonably well with a simple matrix, so it is debatable whether a more detailed LUT profile is going to yield better results. If that is the case then it might be a reasonable proposition to convert a scanner LUT profile to a matrix profile using some sort of best fit algorithm, although I’ve never heard of such a thing. I asked Ed (the author of VueScan) whether he could add support for LUT profiles and he said there are no plans to support it. He didn’t comment on my suggestion that VueScan should at least display an error when attempting to use one. So given that VueScan will never support LUT ICC profiles, and the matrix profiles that VueScan produces are in my opinion so bad as to be useless, I have come up with a workflow to apply LUT profiles after scanning with VueScan. Applying the scanner profile outside of VueScan means that you can’t use any of VueScan’s automatic levels, white balance, or other options in the color tab, but that sort of picture refinement is probably best performed in a tool like Photoshop anyway. You can still use VueScan’s infrared cleaning filter which is one of its main features. – Fist generate the archive DNG file (64 bit RGBI). Make sure Output > Raw output with “Scan” is selected rather than “Save” to prevent any filters being applied to the archive. – Set Prefs > Enable raw from disk = on. If this is not set then the Output > Raw file option will not be visible in the following steps. – Continue with the following settings and procedure, but set the archive DNG file as the source instead of the scanner. – Scan and save. This outputs a raw TIF file with no color profile and linear gamma. – Use a scan of the IT8 slide to check that this has worked properly. The white balance and levels should not require further adjustment if the scanner profile is accurate. – Perform all other operations such as cropping, levels, image-specific white balance, sharpening, etc. Note again this process ignores ALL the settings in VueScan’s color tab, including the scanner color space, because the output is always raw. The preview will still respond to changes in the color tab but the output ignores it. I’d be interested to hear your thoughts about this approach. Another very important thing to note is that when you generate a DNG raw file, VueScan always embeds the built-in scanner profile, even if you have selected a matrix ICC profile for the scanner color space. This means that if you open the DNG file in an application such as Adobe Camera Raw it will apply the wrong (built-in) color profile for the scanner. I believe this is because the DNG specification requires a “digital camera profile” which is more complex than an ICC profile, so if VueScan embedded the ICC profile it would no longer be a valid DNG file. Therefore when archiving in DNG format, always document where the associated scanner profile is stored, or store them together. It also means that you will probably need VueScan to make use of the DNG file, as you can use it to convert back to a standard TIFF without applying the embedded profile as described above, which allows you to assign the correct profile in Photoshop. Note this issue would still exist even if VueScan did support LUT profiles, so it’s probably just as easy to consistently apply the scanner profile outside of VueScan and forget about its scanner color space option. Ian, to answer your question regarding an alternative to LProf that runs on a Mac, I don’t know of any other good GUI tool that doesn’t cost hundreds, but there are several ways you can run windows programs from a Mac, or you could get yourself an old second-hand Windows laptop. You don’t have to create the profiles very often so dragging it out when needed shouldn’t be too much of a hassle. Wow, thanks for much for your workflow! I was going to ask you what you’ve found to be the best output settings, I am definitely going to try it out. I actually found a GUI wrapper for Argyll CMS. I did a bunch of digging last night around a Mac profile generator and stumbled upon Rough Profiler, http://www.jpereira.net/rough-profiler/crear-perfil-color-icc-con-it8-colorchecker. There is a Windows version as well, http://www.jpereira.net/descargar-rough-profiler-windows. The entire site is in Spanish, but the app itself is in English. The resources seem pretty solid -from what I can tell- around the app, utilizing most of what Argyll CMS can do. I tried a few quick test last night and it seemed to work. You are able to create matrix-only profiles, so it’ll be interesting to see how VueScan handles them (if at all). I’d love to hear your thoughts around Rough Profiler and an Argyll created ICC profile. I’m thinking I’ll be able to do some more in-depth testing this weekend. Hopefully this can be the solution I’ve been looking for which is going to make processing film so much smoother! The good news is that Rough Profiler does a pretty good job of creating profiles. Where did you hear about it? There aren’t very many hits in English even if you google for it directly. Using Chrome to view the website with automatic translation enabled makes the site easier to navigate. It’s a bit buggy when it comes to defining the target area but it’s easy enough to crop the target image in advance. At least it shows you visually what areas it’s using. LProf is still better in this respect though. I’ve generated some profiles using different algorithms and tested them for accuracy. The default XYZ cLUT profile seems to be very accurate. White balance, black point and white point are all very nicely tuned without manual tweaking. The bad news is that the matrix-only profile is a poor substitute for a LUT profile. White balance is significantly out and it produces colours in the IT8 slide that are very different to those produced with the LUT profile. This is however not a big issue as VueScan still doesn’t like RP’s matrix-only profile, so compromising on the quality of the profile wouldn’t simplify the workflow anyway. Since you need to apply the profile in Photoshop you may as well use the high quality LUT profile. Even if VueScan did accept matrix profiles generated by Rough Profiler I don’t think the accuracy is sufficient to use them so I won’t bother asking Ed why it doesn’t work. The yellow lines represent the difference between the reference colours and the scanned colours with a particular profile applied. Notice how poor the VueScan generated profile is compared to all the others. The fact that the matrix profiles are not a good substitute for LUT profiles has pretty much decided it for me. I’ll only use VueScan to scan and perform IR cleaning, and apply the colour profile and all other fine tuning in Photoshop. VueScan’s ability to archive images in 64 bit RGBI format will also be useful. Turns out there are not many Mac GUI wrappers for Argyll CMS, I really did stumble upon Rough Profiler after downloading a few that didn’t work. I think it was the screen-shot image of the program that prompted me to translate the page instead of continuing my search. Rough Profiler is working great for me. My scans are finally looking like my slides! I’m still doing some playing around to see if I can tweak profile a bit. 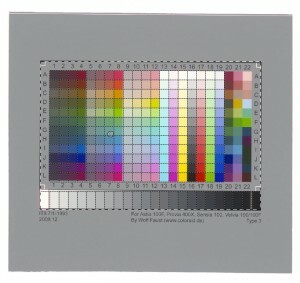 Wondering, do you make small colour adjustments to the IT8 chart after you applied the ICC profile to make sure that the white balance is more accurate. I’ve found that a few of my tests have skewed a few points too blue or too red. I’m also playing with analog gain to see how that affects the overall profile. I tried outputting a raw tiff file (not dng) as you suggested, but I keep getting a really underexposed image. I’m not sure if I’m doing something wrong. I have “Raw output with” set to “Save” and “Raw save film” turned on, which to my understanding should correct for exposure and infrared. Any suggestions? Again Martin, thanks so much for your help and advice. I’m excited to eventually have profiles that actually work. I’m pretty happy with my generated profile without tweaking. The neutral squares on the profiled IT8 scan have a very slight red cast, but that is actually on the slide (confirmed by checking the reference data). The colour cast is probably on the slide because the IT8 slide is Velvia film which is normally strong on red. I don’t know why you would be having white balance issues, unless you’re generating matrix profiles instead of LUT. Which algorithm are you using? Are you using the high quality setting? Have you been using raw files or attempting to use normal TIFF files? If the latter that might be what’s causing the issue. It would be interesting to see one of those LProf CIE diagrams for the profile you generated. The issue you see with the raw file being “underexposed” is completely normal. It only looks underexposed because the raw output has linear gamma. When you open it in photoshop, it sees that no profile has been stored with it and doesn’t know that it is linear gamma. It just assumes it to be the working profile, which will probably be Adobe RGB or sRGB with gamma of 2.2. This false assumption by Photoshop (and other image viewing programs) is what makes it look dark. If you have generated your scanner profile from the raw image, and then apply that profile to a raw image, photoshop then knows that it is linear gamma and will apply a gamma of 2.2 when converting it to the working profile, brightening it up to normal. The important thing to understand is that the raw image is (probably) not underexposed. 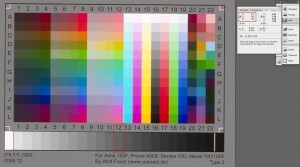 Even though photoshop reports the dark areas having RGB values close to zero, it is only reporting the high-order byte. Assuming your scanner is scanning 16 bits per channel, all of the hidden detail is stored in the low order byte, and the image will still produce excellent detail in the shadows once the gamma is applied. If you’re playing around with the analog gain when scanning your IT8 slide, make sure none of the channels in the white rectangle get clipped in the raw scan. In practice I don’t think you should see much difference in the colours by adjusting the analog exposure. The only benefit might be to get the maximum detail out of the shadows, but I use VueScan’s multiple exposure feature to achieve that and it works very well. Setting the “raw save film” option doesn’t do anything at all unless you specify the Film ICC profile, and it only accepts matrix profiles, so is virtually useless. If you don’t supply an ICC profile it doesn’t seem to apply any profile, regardless of the slide vendor/brand/type settings. 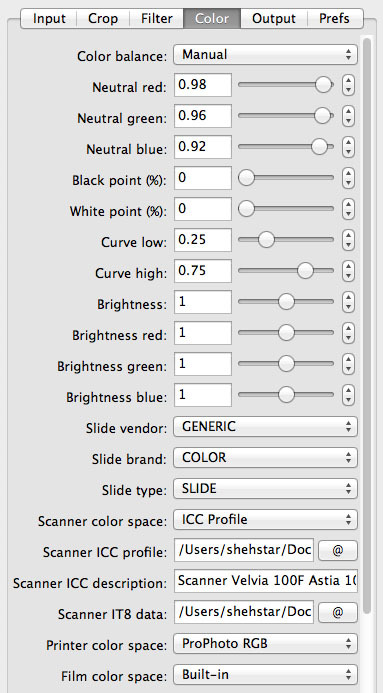 If you do supply an ICC profile it seems to apply it by altering the RGB values rather than embedding the profile. I really don’t know what anyone would use this for, but that maybe because I don’t fully understand what it’s doing. Martin, you just gave me the single best VueScan tip! I have never understood the Raw output setting. Whenever I tried it, the resulting “underexposed” image always frustrated me. The only information I have found regarding Raw files were that underexposure was normal and to only use raw as an archive format to use with VueScan. This new understanding about raw files simplifies everything. Scanned files are as close to the original film as possible, and having a proper profile to insure that the colours are correct. From there the rest is over to Photoshop to edit. I have never been able to trust the images that I’ve scanned; they have always seemed off. I’ve spent so much time playing with tiff generated files with different scanner settings, profiles (as you well know now), and on the editing side. Now I feel confident the raw scanned files and profile are correct. The ICC profile generated from the raw file is great. I’m thinking of writing up an updated post about scanning and profiling with VueScan. All of this new found info about scanning has come from you, is there a website that I can use to link to you? Again, thanks so much for all of your advice. I’ve learnt more in the last few days than in the last few years. Thanks for your feedback Ian. I think it would be a great idea for you to document a “best practice” guide to VueScan from all of this, as I’m pretty sure no-one else has come up with this workflow. Most other references to scanner profiling in VueScan say to use VueScan’s inbuilt capabilities which is just plain bad advice, and the ones that mention using a third party program to generate a profile incorrectly say to output a processed TIFF file from VueScan using the built-in scanner profile first. Both Rough Profiler and LProf are worth mentioning, especially LProf’s CIE diagrams. Rough Profiler is a great find and it seems completely unknown outside of the spanish-speaking world. I was really just looking for confirmation from someone else that they can also get great results using a good quality profile applied to a raw file without the need for manual colour balance tweaking, and to confirm that VueScan generated profiles are really that bad. Now that you have confirmed the workflow works for you as well, I’m confident that it is in fact the ONLY way to get accurate colours out of VueScan. Have fun with your scanning! I’m glad that the discussion was helpful. I am going to be writing a proper blog post soon to answer your exact question, but in the mean time here is the workflow. You actually don’t create the .icc profile in Vuescan at all. Vuescan is only used as the scanning software. The first scan you create will be the particular film target you want to profile. Scan the film target as a tiff-raw file – make sure DNG is not checked, you want to create a Tiff file not a DNG file. This file will look extremely under-exposed but that’s because the proper gamma setting isn’t applied to it. Next you will need an ICC profile generating software to create your profile; if you’re using a PC use LProf, if you’re using a Mac use Rough Profiler (Rough Profiler’s website is in spanish, but the program is in english). Create your profile by referencing both the film target scan and the iT8 reference data document that accompanies yours film target. The software will generate a proper ICC profile for you. Now that you have your proper ICC profile, scan your film as a tiff-raw file (same setting as before), open the image in Photoshop (again it will appear underexposed), and assign your newly created ICC profile to the image (Edit-Assign Profile-Choose Profile). Once you assign the proper profile you will see your image change to the proper exposure as well as the proper colour. That’s a super quick rundown of the workflow. Let me know if you have any questions. forward to reading the above info in your blog post. I’d recommend using Rough Profiler over LProf. It is also available on PC. Contrary to my earlier remarks it does an excellent job of automatically finding the target even without cropping the image or manually defining the corners, and generates an image showing the actual sample squares. It seems to create very similar profiles to LProf, maybe slightly better. The profiles generated by CoCa are significantly different to the other two so I don’t trust it as much. Try them all for yourself and use LProf’s CIE diagrams to compare the results. Thanks for your comments. Unfortunately there is no real way to profile negative film. I don’t know much of the reason why – from the little I’ve read in the past there seems to be too many variables and not enough fixed reference points. 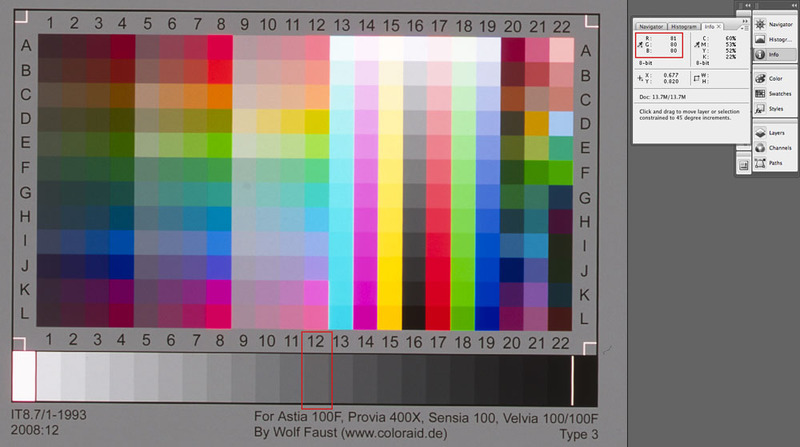 You could try to use a neutral profile, like a Fuji Astia, to get an initial starting point. The problem is that there is a lot of latitude in negative film and a base slide profile may skew it too much. I think as long as you keep your scan fairly neutral, you should be able to colour-correct it in Photoshop. That’s as much advice as I can give you on the subject – other than try starting slide film.